Smoke and flames engulf a test chamber serving as a simulated museum storage room at NIST's National Fire Research Laboratory. What strikes terror in the hearts of museum curators everywhere? Budget cuts, surely. But worse yet, the prospect of precious, irreplaceable relics being damaged or destroyed in a fire. The Sept. 2, 2018, fire at Brazil's National Museum, estimated to have consumed 90 percent of its 20 million cultural and scientific artifacts, underscores the reality of this danger. So, how does the Smithsonian Institution, steward of over 150 million artifacts — from the spacesuit Neil Armstrong wore on the moon to Dorothy’s ruby slippers — prepare for such disasters? Click here to read the full blog post about this collaboration between the NFRL and Smithsonian Institution. Is it over yet? 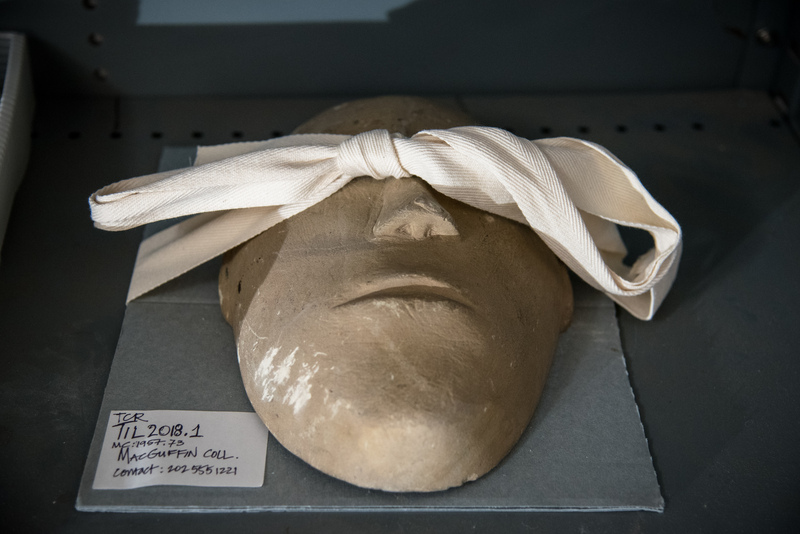 A pottery mask from, amusingly, the "MacGuffin Collection" awaits the burn. 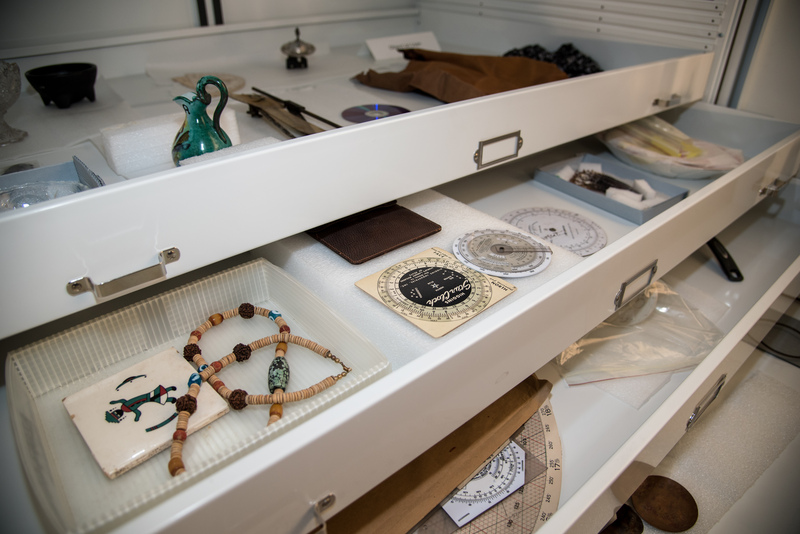 Shelves inside a storage cabinet are filled with a variety of different objects. The shelves and cabinet doors were closed before the fire began. 360° video (CLICK AND DRAG CURSOR IN VIDEO TO CHANGE ORIENTATION) of a simulated fire inside of a replica of a museum collection storage room. The experiment was part of a Smithsonian Institution's Preparedness and Response in Collections Emergencies (PRICE) workshop held at the National Fire Research Laboratory (NFRL). The fire was ignited using an 'electric match' placed in a trash can filled with shredded paper and plastic bottles and spread to involve a cardboard box filled with packing peanuts and neighboring materials. The fire was extinguished manually using an overhead sprinkler prior to compartment flashover at an upper layer gas temperature of approximately 750 C. The spherical camera used to record the video was housed in special enclosure developed at the National Institute of Standards and Technology (NIST). For more fire videos visit NFRL Videos and the NIST Fire Video Collection.